The wait is over! If you’ve been following us on Twitter, Facebook or Tumblr you’d already have heard the news. Our ever popular SHRED tee is now being sold in limited edition colors and quantities through our good friends at The TShirt Exchange. 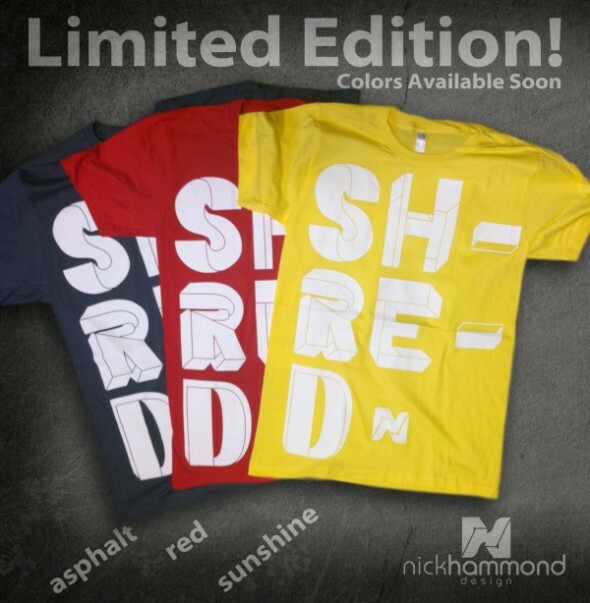 The colors, as seen above, come in Asphalt Gray, Red and Sunshine Yellow as opposed to our original Black colorway. We’ve been sold out of the SHRED tee’s for a while now so here is your opportunity to snag not only a sold out shirt but a limited edition color as well! Slide on over to The TShirt Exchange at http://www.TheTshirtExchange.com to get yours. Make sure to keep an eye out for more posts about The TShirt Exchange as I have a feeling we will be partnering up with them a lot in the future.